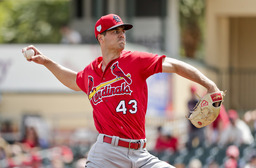 JUPITER, Fla. (AP) Cardinals manager Mike Shildt says Dakota Hudson will break camp as St. Louis' fifth starter. Hudson earned pitcher of the year honors for the Cardinals farm system and in the Triple-A Pacific Coast League last season. He emerged as the winner Thursday from a six-way battle for the final rotation spot this spring. In the end, Hudson beat out John Gant, who will be sent to the bullpen for opening day. The 24-year-old Hudson was 4-2 with a 2.63 ERA in the majors last season, making all 26 of his appearances in relief. He had a 1.72 ERA in 15 2/3 innings in this spring. Pitchers Austin Gomber and Daniel Ponce de Leon were sent to minor league camp. They will start for Class AAA Memphis. Top prospect Alex Reyes is set to begin the season in the bullpen. Carlos Martinez, last year's opening day starter for the Cardinals, will begin the season on the injured list because of shoulder weakness. Hudson joins Miles Mikolas, Jack Flaherty, Michael Wacha and Adam Wainwright in the rotation. Mikolas gets the ball opening day. Shildt has yet to announce a schedule after that.